My first year in business has come and gone and I’m still in shock that I get to wake up every morning and help producers build their brands. Owning a marketing and design business was always my dream but if you asked me, heck, even a year and a half ago, I would have told you that I first wanted to build my resume and work in marketing for a few different corporations. I guess the good Lord knew what was meant to be because when the time came, all my arrows pointed towards starting Piper View Designs and then to leaving my 9-5 and going out on my own. Now that I’m a year in, I simply want you all to know how truly thankful I am for all the clients I have gained, the brands I get to work with and the opportunities this year has brought me. I appreciate you taking interest in my business and am excited for what the next year will bring! Knowing how fortunate I am for the life I lead I try not to get bogged down by the pits that come with starting your own company. Know, there were definitely doubts and nervous breakdowns, but through those rough patches, I realized three things I always fell back on. I think anyone starting out has idols and an aspiration to be set in their same standards. I know I did, I wanted my work to be comparable to some of the best. But I realized I had to continuously remind myself to come back to reality, some of those idols of yours have been doing this for years and years. It’s okay to be a beginner and to make mistakes, learn from them and do better next time. Put in the hours to critique your skill, continue to develop new talents and your effort will be reflected in your results. Going off of allowing yourself to be a beginner, there is nothing wrong with asking for help. There have been multiple times I have been stuck or have needed someone else’s eyes and have reached out for that to get some great feedback that took my designs to the next level. I have also reached out to women who have never responded to my questions, and this is okay too. By asking for help you create a community of people you know will have your back and support you and your business. I welcome any question from any other aspiring boss babes (or dudes) out there that just need a little help, I know your struggle and will always get back to you! Essentially, there are a lot of people out there offering the same service as you. What is it about you that sets you apart from them? Being your authentic self will help you determine this; be real, be transparent, be prepared and give it all you got! I realized this early on and am thankful for that. 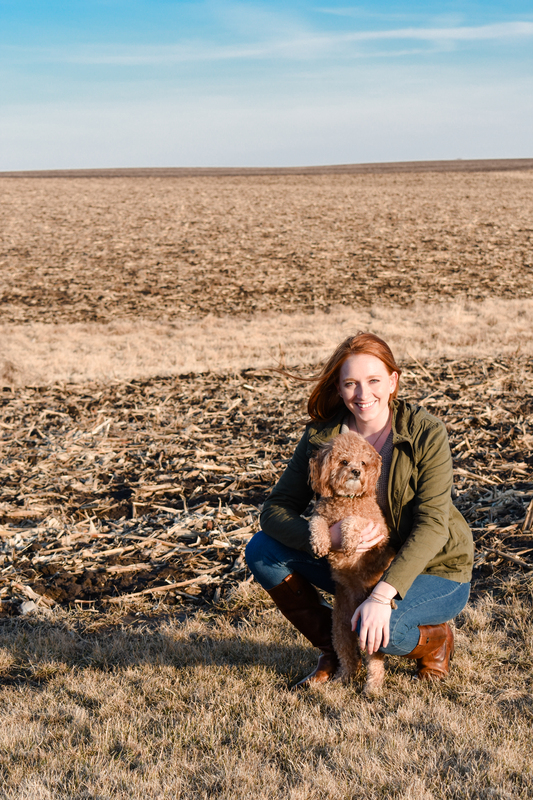 I am a marketer and graphic designer who helps farmers build their brand and communicates their brand story consistently, over and over again. I am also a music junkie and proud dog mom. I didn’t grow up on a farm but was fortunate enough to grow up in the dairy industry, I was hooked from my first calf. I’m a small town girl with a deep-rooted passion for all things dairy. Thank you for taking interest in my business, for supporting my small business and for simply clicking this blog link! I look forward to Piper View Designs second year and hope to chat with you soon! Also, I appreciate your time and want to give you a little something for it. If you subscribe to my email list, either by opting in or by shooting me a message through my website here or through Facebook with your email I will be offering 15% a Logo or Ad Design until February 1st (that’s tomorrow!). I want you to also know, I don’t plan on weighing down your inbox. I will be sending one email a month about what I’ve been creating and working on and will also be providing FREE giveaways (like a social media marketing plan) or a discount for certain services in every email I send. Again, I appreciate your time and hope to see you on my email list soon!